‘Floating’ involves laying in what is called a ‘sensory deprivation tank‘; a fiberglass vessel that provides a completely lightproof and soundproof environment in which to float in warm water containing 600kgs of Epsom salt. The idea was developed by neurophysiologist John C. Lilly as a way of testing the effects of cutting off external stimuli to the brain. He called that process REST – Restricted Environmental Stimulation Therapy. The complete sense of calm that is induced inside the tank provides benefits that include relief from stress, pain and insomnia as well as increased mental clarity. There has been much talk of various psychological benefits and hallucinations that can occur, but the physiological ones were what drew me initially, as I figured that it would make an excellent tool for active recovery for athletes. As well as that, I wanted to know if it would provide a good opportunity to practice mental training. It’s definitely a strange and daunting process when approached for the first time. The term ‘sensory deprivation‘ sounds rather scary in itself, and one can never know how their body or mind might react to it. 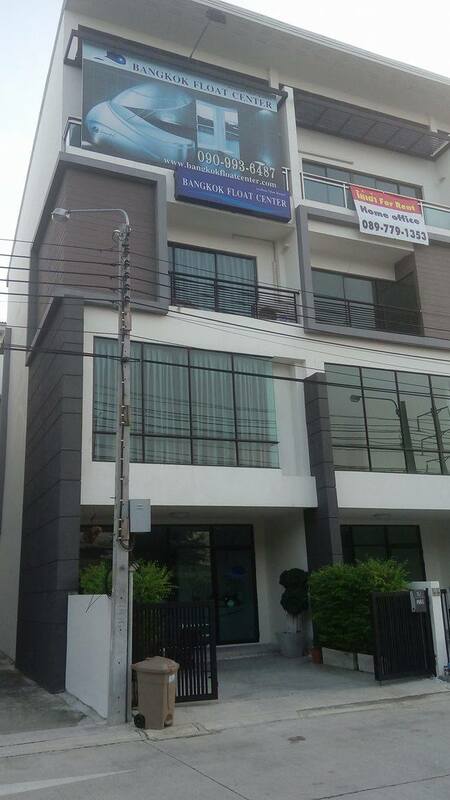 I thought about the fears and concerns that I felt were normal for this situation: claustrophobia, drowning and generally freaking out, but was still very eager to try it and after reading up on it, found that ‘Bangkok Float Center’ was very close to my gym, just down the road from where I work. It was perfect. I booked an appointment online and went in the following afternoon. Bangkok Float Center from the outside. When I arrived, a lovely lady on the reception welcomed me in and led me into a ‘chill out room’ with sofas, books, paintings that people had done after floating, a massage chair, a TV showing float-related videos and a guest book signed by previous customers, along with polaroids of them on the walls. In the corner, there was also a dresser with products for customer to use after their session. There, she made me a cup of tea and chatted to me for around 15 minutes to give me all the information I needed to feel comfortable and confident about doing my first float. She was obviously very knowledgeable, experienced and passionate about it and she really made me feel at ease, giving me lots of tips to get the most out of my time in there. She told me that it typically takes around 25 minutes to completely relax during the first float, with the most difficult part being able to fully relax the neck without fear of letting the head get submerged, despite the fact that the density of the water makes this completely impossible. She also assured me to go in without any expectations and just ‘let go’ as much as possible. From there, we walked into the next room, where the float tank was located, and she guided me through what I would do. First, I had to take a shower to remove any products or oils that might contaminate the water, then put some ear plugs in and get into the tank completely naked. It is possible to wear a bikini, but users are encouraged not to because the material may be distracting and detract from the sensory deprivation experience. When you first enter the tank, you’re immediately made aware of any cuts or grazes on your body by the sting of the salt on them, which fades very quickly. I lay back and floated for a minute to allow myself to get familiar with the feeling before I became comfortable enough to close the lid. The next step was to turn the lights off. Inside the tank, there are two buttons. The one on the left is an ’emergency button’, which alerts the staff to come to your aid if you’re having any problems. The one on the right controls the light and provides two options; either alternating colours or complete darkness. I found the first one a little distracting, so opted for the latter. At first, I felt the need to keep my hand near the button in case I panicked without being able to find it. However, I soon found that to be not only detrimental to my relaxation, but pointless because it’s not possible to float too far away from it. The tank doesn’t look particularly big, but is built to allow people up to 6ft 4″ float with their arms and legs outstretched without touching the sides. When you’re in there with the lights off, you completely lose any sense of spacial awareness, which makes the slightest movement in the water feel like you’re drifting really far. The water and air inside the tank match the temperature of your skin, which means that after a while, you lose sense of the boundary between your body and the water and somehow forget that you have a body at all. I loved that feeling. Contrary to the advice that it would take 25 minutes for me to relax, I found myself falling into a deep sleep very quickly. Aside from a feeling of weightlessness and extreme relaxation, the only thing I remembered was at some point being very aware of my digestive processes, feeling every movement in the way that you only realise when you put your ear to someone else’s stomach. I’d been told earlier that this was to be expected, so I didn’t worry. With my sympathetic nervous system (which responds to physical and physiological stress and triggers release of adrenaline and cortisol), being deprived of stimuli, my parasympathetic nervous system (which slows heart rate, conserves energy and generally works to calm the body down) seemed to be heightened, which made me more aware of the basic functions of my body that I never usually pay attention to. For what must have been the majority of the session, I slept so deeply that when the soothing music came on to signify the end of my 60-minutes, I was sure that it had to be a mistake. I felt as though I’d only been in there for five minutes and wondered if perhaps I’d just taken a rather expensive nap. Afterwards, I sat with the same lady who’d guided me through beforehand while she asked me how it went, seeming genuinely excited to get my feedback. She was really great. Although I really enjoyed it and felt very relaxed, I knew that it was the kind of thing that would take a few tries to get used to and that I wouldn’t be able to get the most out of just one try, so made plans to go back for another one the following month, this time for 90 minutes. My second session was quite different from the first. I was much more relaxed going in and felt completely comfortable closing the lid, turning the lights off and just getting into it immediately. Shortly after, I felt myself twitch a few times as I drifted out of my conscious state and eventually, I was able to visualise. 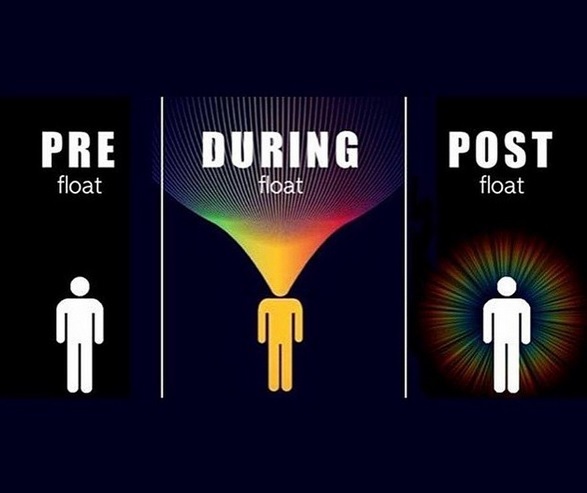 Flotation therapy can be either active or passive and as my first session was completely passive, I wanted to make this one active. I thought about my fight on the Queen’s birthday and how I’d like to rematch my opponent and fight her differently. I saw myself training and hitting with power, something that has inexplicably gone missing and I’m now working on getting back. When I wasn’t thinking about anything, I felt an overall sense of happiness that is very hard to describe. Later, I became very aware of aches and pains in my body that were previously unknown to me, including the tension in my knees from my 15-km run earlier that day. Somehow, it felt as though those pains were slipping away, which made me understand why floating is so beneficial for people with chronic pain. I started to see glowing lights and assumed that it was coming from the bulb inside the tank, but when I later opened my eyes, I realised that I had never turned it on and was still in complete darkness, which meant the lights had just been conjured up by my brain. I should add that I did have to get up and pee at some point during this session. I’d like to say that it was mid-way through, but there is absolutely no concept of time in there, so I really have no idea. I definitely didn’t want to take the chance of relaxing too much and having and accident, which was a genuine fear of mine (customers have to pay 30,000B if this happens). My short break didn’t ruin my session though, and I was able to slip back into it straight away. I have no idea if I slept at all during my time in there or if I was just in a ‘theta state’ the entire time, but it really was something to be completely alone with only your own thoughts. I came out of my second session feeling somehow different from my first. It seemed as though I had hit a deeper state of relaxation than before, and felt very light, at ease, and as though there was no pressure at all on any of my muscles. Mentally, I felt sharper, too. After a difficult period, I’m starting to find my focus again with regards to training and fighting and I think this was a really good time for me to try floating. I was able to visualise myself fighting and feeling good about it, which, after a four-fight losing streak, has been a very difficult thing for me to do recently. I sat in the lounge and jotted my thoughts down into my notebook and the staff reassured me that I could take as much time as I wanted and left me to be alone. The whole thing is a very private experience in a clean and comfortable in environment that had obviously been put together with passion. I’ve never been to another float center so have nothing to compare it to, but I really enjoyed this place. I’m definitely going to continue to use flotation therapy as a recovery tool in the future. The feeling you get in there just isn’t available anywhere else. This entry was posted in Mental, Other and tagged float tank, flotation therapy. Bookmark the permalink.